What tools and supplies would it be a good idea to bring for the amp build? allen wrenches, solder & iron, screwdrivers, both flat & phillips, small ajustable wrench, pliers, wire cutters & wire strippers, small hemostats to hold things while you solder can be of some help! small wire ties, maybe a magnifying glass, patience & alcohol & weed! my skills have vastly improved in the past several years. You gotta admit,, that was some serious solder,, enjoy the fest and the amp build,, wish we were going to be there. Have fun!!!! I've got some high silver content solder. Bringing about two pounds or so. 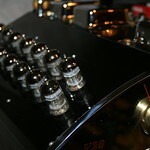 I'll have a big collection of vintage 12AT7/12AX7 tubes, many for sale and/or rolling. I will be bringing a tube tester and a TEK 'scope as well.